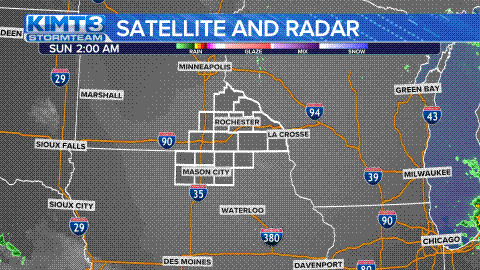 Overnight several inches of rain fell across northeast Iowa. This has caused fairly widespread flooding and many area rivers are either flooding or quickly rising. * At 1105 AM CDT, local law enforcement reported flooding across northeast Iowa. Many rivers and streams are out of their banks. Several road closures have occurred due to standing water. * Some locations that will experience flooding include... Eldorado, Waukon, Nashua, Fredericksburg, Elgin, Clermont, Spillville, Fort Atkinson, Ridgeway, and Ionia. Flood waters are moving down the Turkey River from near Cresco to Elgin. ...Forecast flooding changed from Minor to Moderate severity for the following rivers in Iowa... Cedar River at Charles City affecting Floyd County .Runoff from overnight rainfall continues to result in flooding along the Cedar River at Charles City. River forecasts take into account both observed and forecast precipitation. ...Forecast flooding increased from Minor to Moderate severity... The Flood Warning continues for The Cedar River at Charles City. * At 10:30 AM Friday the stage was 12.4 feet. * Forecast...The river will continue rising to near 15.7 feet by Saturday morning. The river will fall below flood stage Saturday evening.